Today, as in years past, we again gather to pay tribute to the memory of five republicans, who made the ultimate sacrifice here in Edentubber, as a result of a premature explosion on this lonely mountainside in the early hours of Monday, 11th November, 1957. While later tragedies would sadly eclipse it in number, at the time this would be the single biggest loss of life incurred by the IRA since the bitter counter-revolution of 1922 – 23. The four IRA Volunteers, assisted by Michael Watters, were preparing for an expedition that would take them across the border. This was to be another chapter in what we republicans remember as the Border Campaign of 1956 – 62, to the members of Oglaigh na hEireann, it’s codename was of course, Operation Harvest. Operation Harvest would take place against the backdrop of great economic hardship and mass emigration across the two partitioned states in Ireland, and would be the first armed campaign in the 20th century by Oglaigh na hEireann to focus exclusively on the occupied six counties. After Oglaigh na hEireann’s repeated repression by successive Free State governments since the counter-revolution of three decades before, in 1948, an IRA Convention issued General Order No. 8, prohibiting "any armed action whatsoever" against the 26-county state, thereby focusing their attention to the north-east. In that same year, the Free State parliament had passed legislation that arrogantly renamed this state the ‘Republic of Ireland’. 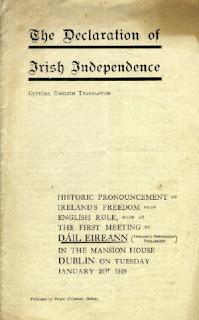 In 1949, the IRA Army Council issued a statement to clarify its position to this development, and we would do well to remember how these words are still true The statement reads as follows: “By an act of British Parliament passed at Westminster in 1920, in a deliberate absence of the entire Irish representation – and through the acceptance of the Articles of Agreement for a Treaty, the Irish Republic, proclaimed in arms Easter 1916 – and ratified in 1919 by the elected representatives of the people of all Ireland – was prevented from functioning, and in its stead two Partition Parliaments were set up to govern Ireland. Thus Ireland was forcibly partitioned by England and has remained partitioned since. Any attempt to give the 26 county area a new status by representing it as “the Republic of Ireland” does and cannot alter this fundamental fact. Operative Harvest would begin in earnest at midnight, 12th December, 1956, and the offensive would be launched across the occupied six counties with the intention to draw the British army out of their bases, only attack the RUC and B-Specials in self-defence and ultimately destabilise the institutions of northern state. While of course they did not outright achieve all of this, the IRA had still caught the governments in both jurisdictions by surprise, returning to revolutionary activity most dramatically in incidents that night in Armagh, Enniskillen, Newry and Derry. The tail-end of 1956 into the months of 1957 would see the brave men of Oglaigh na hEireann step up their bold campaign of sabotage and armed actions in the northern state. On this lonely hillside in 1957 4 IRA volunteers where planning their own contribution to Operation Harvest, and we remember them with pride here today. Volunteer George Keegan came from a family with a proud republican tradition is his native Enniscorthy, Wexford. Keegan was descended from a rebel executed in the 1798 rebellion, and also had a very important link to the 1916 Easter Rising: His father, Patrick, was among the last group of Volunteers in the country to surrender, as they did in Enniscorthy at the end of Easter Week. Patrick Keegan would go on to be commandant of the IRA’s North Wexford Brigade during the Tan War. Following in the revolutionary path of his father, George had been on the run for some time at the beginning of Operation Harvest. When he made the supreme sacrifice for his cause here, he was 29 years old. Volunteer Paul Smith, from Bessbrook, County Armagh, was only 19 years old. Yet, at the time of his death he held the rank of adjuntant in Oglaigh na hEireann, and was said to have a flair for leadership and responsibility. For over six months, Paul lived with a price on his head by the Stormont authorities due to his activities as an IRA Volunteer. The eldest of a family of seven, he was an architect’s apprentice before dedicating his life to the cause, and is recalled as a young man of a happy and carefree nature. Also on the run in this time and would also meet his tragic end here, was Volunteer Oliver Craven, from Newry. Also 19 years old, Oliver was a labourer and driver before joining the ranks of Oglaigh na hEireann. Though a quietly spoken young man, he was noted by his comrades for his cool headedness. It is said before his death, he had avoided capture by the colonial forces several times. Volunteer Paddy Parle, 27 years old, was from William Street, in Wexford Town. A founding member of his local GAA Club, Paddy was also a member of Congradh na Gaeilge. It is said he held a special affinity for the writings of James Connolly and the cause of the Irish working class. At the outset of Operation Harvest, Paddy, along with several Wexford men, became an organiser and member of the Vinegar Hill Column. 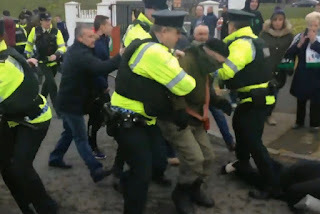 While arrests put an end to their activities, Paddy himself avoided capture and continued to be a dedicated soldier of Oglaigh na hEireann. Also today, we also remember Michael Watters, the 50 year-old forestry worker who lived alone in the cottage that stood near this spot where the four soliders of the Irish Republican Army were preparing to head over the border that on fateful night. Though not a member of the IRA, Michael Watters followed in the tradition of countless, often forgotten ordinary men and women down through the decades. who helped in any way they could for the cause of a free Ireland and the soldiers who would fight for their country. In this instance, he provided his home in what he surely believed was a safe base for them to operate. Men and women who provided shelter, food and safety for IRA volunteers were the backbone of the Republican movement and we must never forget their contribution, without it the IRA could not function. Today we are in a situation not unlike the Border campaign period, fundamentally we have to be honest - we too have divisions within our movement, mass imprisonment, and a poor strategy for gaining support, we must like the patriots of Operation Harvest have the maturity to reflect pragmatically on our failures and address them. We must take the lessons of history. We all stand here today as proud and unrepentant Irish republicans, however this is not enough, we need to work together to secure our independence, we cannot lose sight of that goal. We cannot deny that the last few decades have served a severe body blow to our cause, successive sell outs and factions have immeasurably damaged morale, and how can we unite a Country if we cannot even unite ourselves in a movement of people, ready for radical change? We have very real immediate issues that we must focus on, we have Irish Republican prisoners by the hundred, the British Police continue to raid homes and harass people, we have internment still alive and kicking with Tony Taylor interned now for nearly 2 years, in the 26 counties an onslaught of IRA membership charges have taken dozens of Activists off the streets, all of these things and more are designed to crush any last remnants of opposition to Occupation, couple that with the enormous normalisation project going on all over Ireland, the attempted rehabilitation of the British Army, the GAA running recruitment adverts for the RUC, the shameful wall at Glasnevin commemorating British Army along with our patriots and honestly the list goes on and on. We must oppose it all and we must stand together and do it, we must make Republicanism a force to be reckoned with once more. For too long now we have been consigned to the fringes, for the general public genuine republicanism has been pushed to the history books, our job now is to ensure that Republicanism is revitalised for a new generation, and that with the help of future generations coming up, we will one day finally see the establishment of our declared Republic. 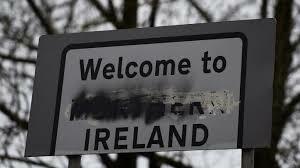 The next few years will see many changes not least because of Brexit, the fears surrounding Brexit for Irish people seem to be centred on the border, scare mongering abounds while the Politicos in Stormont try to exploit it to their advantage. The idea that there could be border posts is a shock for many people; this reminds them that we still live in a divided and occupied Country. As Republicans we do not need this reminder, we are all too aware of the very real British occupation that is ongoing. The People who are deluding themselves that everything is ok in Ireland as long as there is no physical border perhaps needs this little wakeup call! The Edentubber Maytyrs goal was to eradicate British rule in this Country, and we know what the volunteers in the 50’s did with Customs huts on the border back then, not that I would advocate that now!! Comrades, six decades have passed since George, Paul, Oliver, Paddy and Michael gave their lives for Ireland not far from where we stand. They left us a heroic legacy that we, the faithful few, will always continue to commemorate and be proud of. As republicans, while our strategies and the means available to us may greatly differ then those employed by the volunteers of Operation Harvest, we share their same goal: That of a free and united Ireland. Let their memory inspire us always and may we never be dissuaded from the path of restoring the true Irish Republic of which our martyrs dreamed. one thing i may add, faith is really important, in the individual and collective, because sometimes doing and saying the right thing is unpopular or unfashionable even within people of the same general way of thinking. but if its right is right. like the truth, unpleasant will be had to be said. Sorry I express my self badly. No complains, actually for me this is not so long, but as you said it was so … ; ) Sometimes a long thing can’t be made short. And it is an enough special historical event to take your time to express yourself, talking about the cause, the context and the 5 martyrs involved. Imo trying to short every thing making everything simple – not easy, simple- making all like fast food, fast politics, fast ideological debates and so does not help, actually harms. Is part of their game.